let's do all the projects shall we? did you know i grew up always wanting to be a interior decorator? my parents both worked in the furniture business so i grew up around designers and high end furniture and so on. i got to go to huge houses on mercer island with my dad on deliveries, marveling at the interiors and i spent a good part of my summers playing house in the various set up rooms around the furniture stores. i was best friends with all the in house designers and even worked as a personal assistant to one later when i was older. when i was a senior in high school i started making plans for a design degree from bellevue and had tons of discussions with my moms designer friends about it. long story short it never happened, you may notice from reading my blog, my career plan changes...a lot. i accommodate for a season of life i am in or have to be realistic about what i can really do right now and what is best for my family. that, however doesn't silence the design bug in me, ever. when i was pregnant with robin i never really caught the nesting bug. other then the last trimester second wind where i cleaned all the things that had been ignored for six months, i didn't feel this major urge to do all the projects. now that robin is rounding one year and self entertains for quite a bit of time on his own i have some extra time on my hands. there are currently ten different projects mid completion in my house right now. it's hard because tim works a second job right now and works most nights a week so everything is getting done slowly but surely. we painted the cupboards in the kitchen, sold our dining room table to build a farm table, are converting our upstairs loft area into a play room etc etc. every day i get a new itch to sell a piece of ikea furniture and replace it with something vintage and solid and yummy. thank god for craigslist. 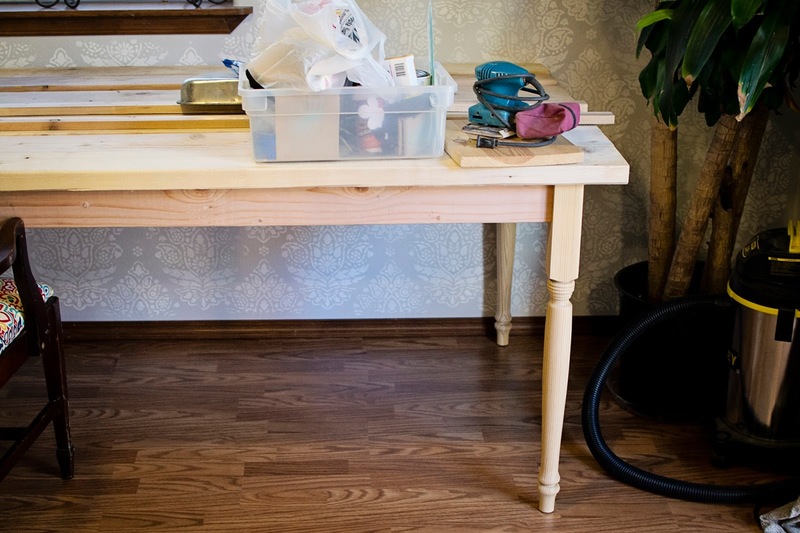 tim has ten new grey hairs in his beard from all my random spur of the moment projects and ideas but i know he has a ton of fun creating with his hands, thus i don't feel bad about the table i talked him into building. coming up this spring we are tackling some of the bigger projects on our house list - like a paver patio and pergola outside. we have a tiny tiny condo lot so we have about four feet out our back door and ten feet out along the side of our house, leaving no room for grass but so so perfect for a entertaining space complete with a swing off the pergola. i am pretty excited. below i jotted down a little list of the top "to-do" swirling around in my head right now. i don't know what has gotten into me - give me all the diy! so stay tuned for lots of fun including a upcoming post on our kitchen cabinet make over with annie sloan chalk paints! how does decorating go in your house? do you have to change your mind ten times before really falling in love with a space or item? what fun is owning a house if you aren't always on the hunt for the perfect look! things we love: freshly picked moccasins with a giveaway! freshly picked moccasins have officially become a staple in robin's year round wardrobe and i am so excited to share them with you guys! like most of the great brands i have fallen in love with over the years, susan is a self-made successful diy genius when it comes to these yummy leather shoes. my favorite part is watching different parts of the creation process via instagram - there is something to be said for a company who openly shares the ins and outs of production, done right here in the us. i am so excited to be working with such a great company, i may have literally squealed when i pulled the package from the mail box the other day. carefully and beautifully packaged, the kids and i all sat on the living room floor and pulled them from their adorable linen bag (which immediately became a holder of stella's current hoard of whatever) and i turned them over in my hands marveling (they're that awesome) at how gorgeous they were and so well crafted. i may have even taken a nice big whiff of the yummy soft suede. robin was sent a pair of the cobalt suede, because duh, every little dude needs a pair of blue suede shoes, amiright? my favorite part so far has to be the fact that they stay on....and on...and on. even when robin bends in half in my arms to chew on the toes they stay put, and clean up nicely after i might add. 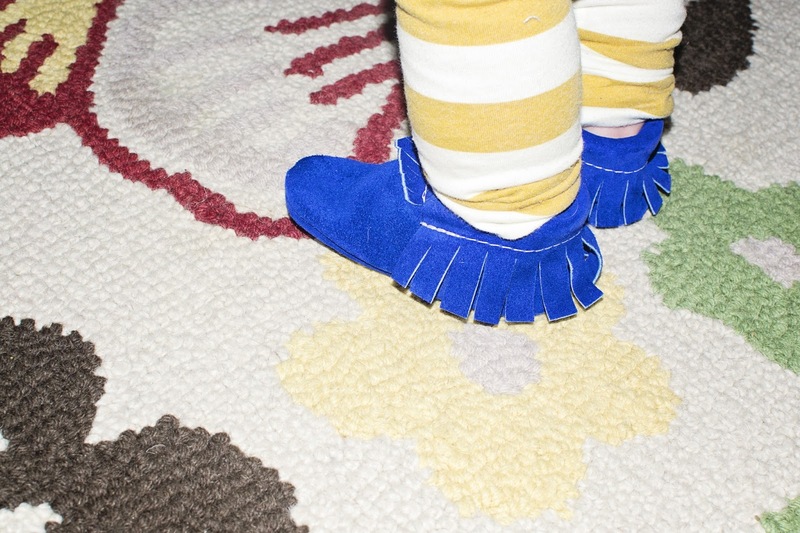 before robin was even born i had stocked up on many tiny pairs of shoes and other brand moccasins and was terribly disappointed when i could never cram his chubby foot into any of them. that is a non issue with freshly picked moccs, designed to easily slip on little baby feet of all sizes. even if you order a size or two big so that they last you, they stay on great! made with a elastic ring around the opening, slipping on and off is easy and picking the right size for you little one is even easier, with a handy printable sizing chart you can pick the perfect pair for your little one. i have talked about before, how important it is to let your almost walker explore his steps in a soft and flexible shoe (or bare feet) for the best results in developing that little foot. freshly picked moccs are perfect for that! robin has newly discovered cruising and his cobalt moccs provide great function and stability for him. did i mention these are the ultimate baby shower gift? 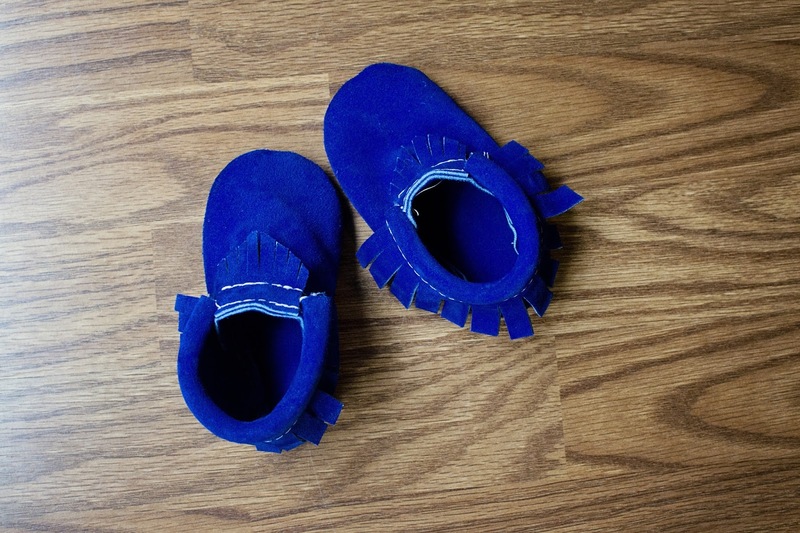 i am super excited because i have teamed up with freshly picked to giveaway a pair of moccasins to one of my readers! you get to chose the style and size, a $60 value! there are tons of ways to enter via the rafflecopter below. the giveaway will run from today until next friday and the winner will be announced on monday. good luck and have fun! disclosure: we received this complimentary pair of moccasins from freshly picked, however all text and opinions are my own. two weeks late but worth the wait! month nine? i mean really we are already at nine and a half months and my mind is blown. i think we have officially hit that sweet spot where robin is so much more of a tiny human then a tiny baby and i spent five minutes the other day begging tim for "just one more?" you might notice the lack of balloons this month - major news flash to us when we went to get his balloons this they had more then doubled in price. i just couldn't bring myself to hand over that much money on balloons when there are so many vanilla chais to be had. just kidding, but seriously, remember when i mentioned in the end what we will have spent on balloons? well, that number had gone through the roof and wasn't logical anymore. so a photo of cute baby sans balloons it is. you can still keep track of what month we are on right? big news this month is standing on e v e r y t h i n g and getting into everything we can reach. robin has officially perfected his crawl and zooms from place to place, sometime we can't get over how quick he is. with his hands too, you can not take your eye of him for a second if rocks are near, he gets them into his mouth so fast, sometimes ones that are so big i have a hard time getting them out. speaking of rocks, this boy still loves the water more then ever! we have spent a ton of time down at the river and he loves splashing in little run off/slow areas, he is content even if the water is chilly. whether it is the cats water, a inch in his crab pool, or floating in a big pool he loves it. we have four new teeth and have only eaten big people food as of late. his favorites are frozen mini pancakes, avocado, peanut butter + jelly, crackers of any kind, tofu, thai food, any meat, oatmeal, etc ect he loves it all. he does a great job chewing and i feel better and better about our decision to blw every day. standing means a whole new world of toy love. i busted out our walkers and activity tables and he can't get enough. robin still loves rattles and toys that squeak but you can tell he appreciates getting to play with more interactive toys now. but his favorites? anything with wheels! cars, computer chairs, stools, you name it he wants to wheel it around. he is such a boy and i love it! i have been busy stocking his amazon birthday wish list with some fun toys with wheels and all things adorable cars and trucks. planning for robin's super hero first birthday is in full effect. even though i go back and forth on if we should do a halloween theme but i figure we have so many years ahead of us to pull of those types of parties, might as well have fun with something different this year! now, what the heck should robin be for halloween? i am having the hardest time! i really wanted him to be "robin" and stella was going to be batman but i can't find any good robin costumes other then this, and even that isn't exactly what i am looking for. suggestions? i can't tell if robin will be walking soon or not, just in the last couple of days he has taken a couple of steps to either side when he is standing, holding onto something. it is so crazy watching how he develops compared to the girls who were all walking well or really close to it at this point. today he tried the stairs for the first time but didn't make it far before i stopped him and closed him on the other side of the gate - he wasn't too happy about that, ha! this is one of my favorite ages and i think tim's too! robin follows tim everywhere and is so heartbroken if tim comes home and doesn't immediately scoop him up for snuggles. we also are at the fun age of separation anxiety, we tried to leave him with my sister who he is familiar with, for a couple of nights and it did not go well. he was sad and whiny the entire time which made it hard to be away and we cut our rip short. we can't wait to see what ten months is like with our little man! 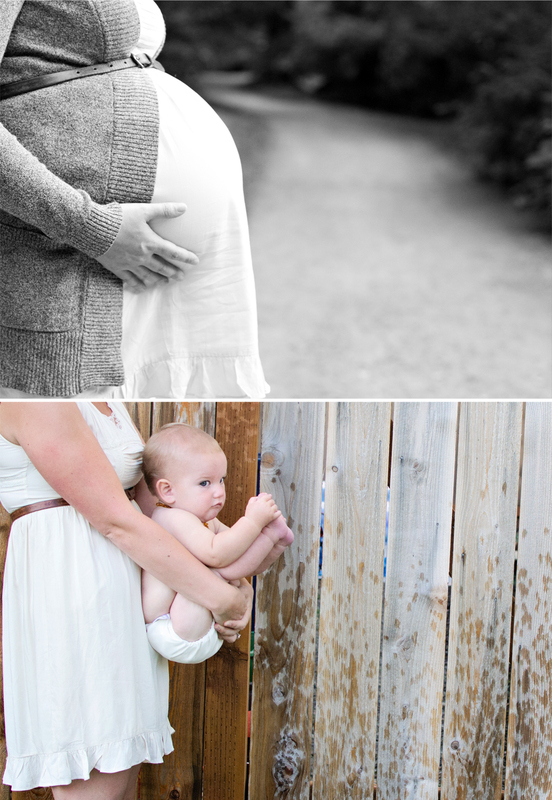 family photos with seattle and portland photographer lulabell photography! 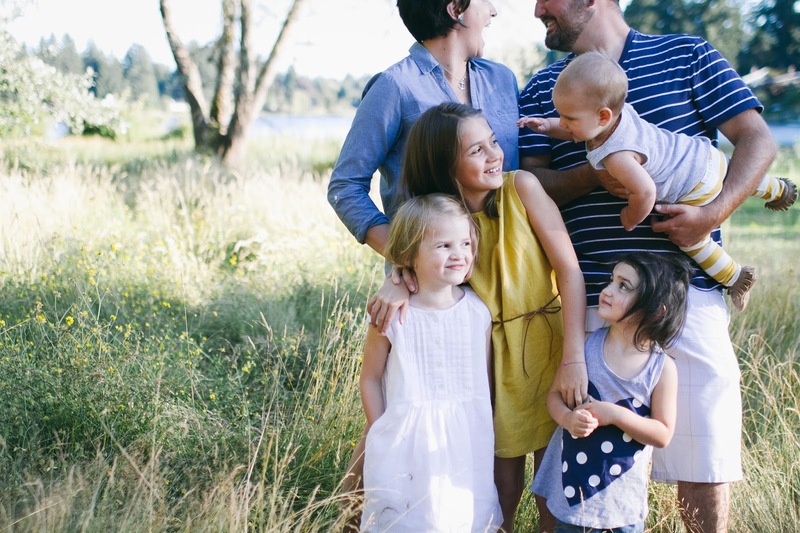 last month we snuck away for some family photos with one of our favorite photographers, lauren with lulabell photography. 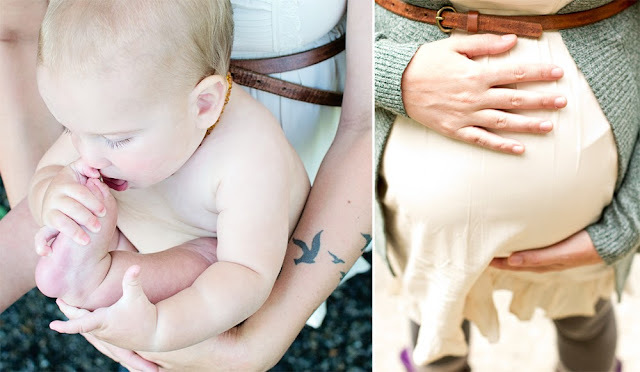 this was our first real deal, full blown, no kids crying because of the cold shoot, since stella was three months old! i'd be lying if i didn't say, "man, trying to get photos of this family of six was h-a-r-d!" i was really worried as i waited for sneak peeks, that it would really show how naughty and rambunctious stella and rowan were being. then when they started showing up on facebook, it was love at first sight! true, you can see how uncooperative they were being in almost all of the photos but after a little pep talk with myself i thought, hey, this is our real life! lauren captured our day to day interactions perfectly, and hello, the girls weren't being naughty, they were being three and five at 7pm. i can't get over how yummy and delicious the lighting is in these photos! 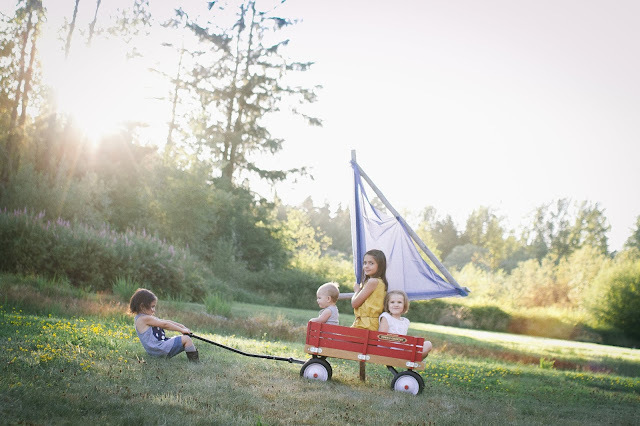 if you are talking family photos in the summer, magic hour is where it's at. i love love working with lauren because she has a ton of style but is willing to work with my ideas and visions too and she lets me bring a van full of props! the wagon and sail idea? literally came to me hours before we left - you should have seen me and tim in the yard fastening this thing together in the blistering sun as we were loading all of the kids in the car. i am glad we did it though, because, hello! if your local to the portland thru to seattle area, i highly recommend checking out lauren! as a mama of two herself she has perfected her ability to calm down sassy children while snapping the most perfect photos chasing them through a field. other then lauren's photography website, you can also find lulabell photography on facebook and instagram! i have even better news for you local (portland and seattle) friends! lauren is officially scheduling for her fall mini sessions. she is super excited to offer two carefully chosen locations, either one the perfect opportunity to snag an amazing christmas card photo. 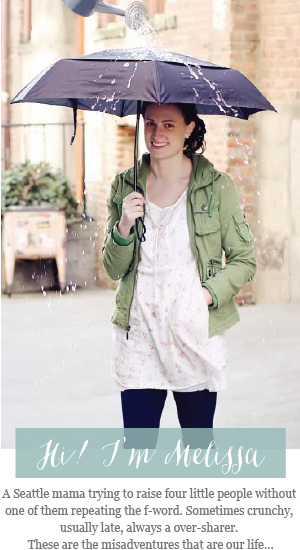 the info: for $75 you get a twenty minute session with five edited photos available for digital download within a week. she is shooting in the pearl district of portland on october 12th and a tree farm in vancouver washington on october 19th. email her at lauren@lulabellphotography.com to schedule yours today! what a fun and simple activity this was! stella even had fun hours after the stuff was put away and i was editing the photos, every time i would pull up a new one she would yell, "bubbles! POP!" 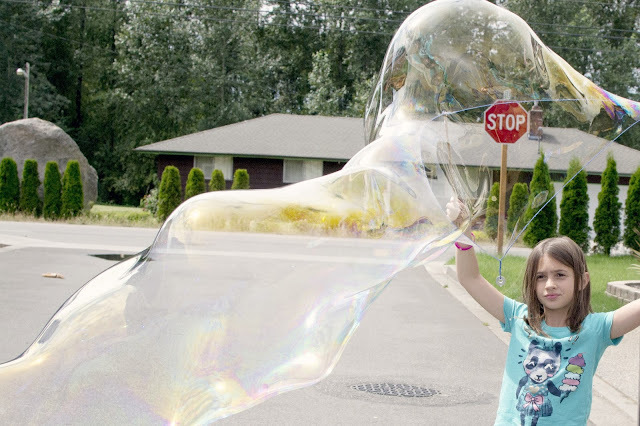 after the pinterest fail on the whole small pool + hula-hoop equals human bubble, i wasn't ready to give up on giant bubbles yet! after noticing that i had a random wooden dowel in my craft closet and having remembered seeing a cool way to do bubbles at a recent parade, i set out to see what else i had to make this happen. wooden dowel however thick in diameter, i cut mine in half. for the bubbles, since i didn't want to have to run to the store - i simply busted out our giant jug of target bubbles and beefed them up with a ton of dawn till i got a good strong bubble. here is a good homemade recipe if you want to go that route. first i cut my dowel in half so i had to equal "sticks" and then i screwed the small eyelet screws into an end of each. 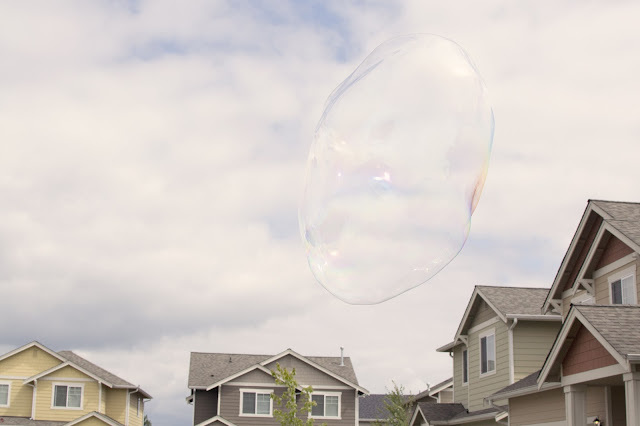 next, i cut two pieces of string - one 35" and one 70" (you can do whatever lengths you want to try for different sized bubbles, they just half to be about this ratio). then i tied our string to the dowels, basically creating a big loop between them. make sure you slide your washer onto the longer piece before tying off. your finished product should like like this (above). when we were ready to play i filled a large cup up with our solution. we spent a few minutes getting the strings nice and soaked with the solution before trying any big bubbles. finally we would submerge all of the string pulling out very slowly. to start the bubble zoë would pull her dowels apart, opening the strings, very slowly while walking backwards to create a little air flow through and voila! 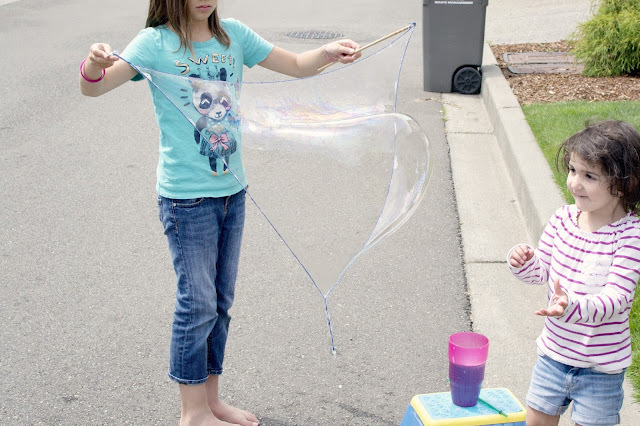 this was a super fun and easy activity and the kids spent hours outside trying out different things - like how long they could make one, how to make big and small round ones, studying how the bubbles behaved as they floated off, and of course how fast they could race each other to be the first to pop one! 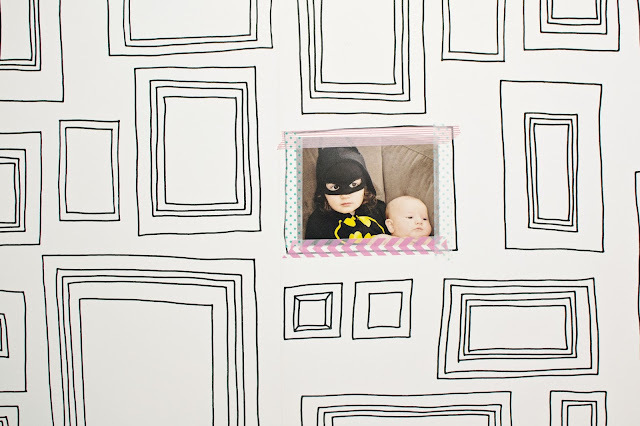 have you been looking for a fun and creative way to use wallpaper in your home? well you found it! 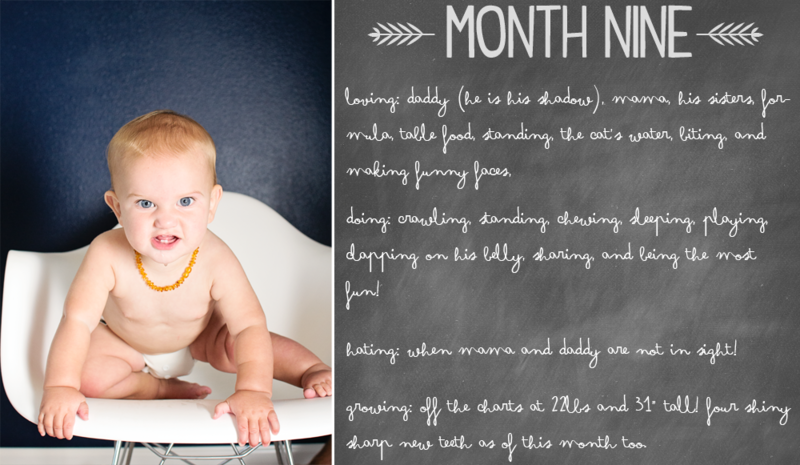 i have always dreamed of letting the kids be the creators of their own spaces and that is why there is practically a chalkboard in every room of our house. so naturally i flipped when i discovered the frames wall paper from british based company graham & brown. when the frames paper arrived on my doorstep, the first thing i noticed was the quality, it was thick and soft and had a really great look to it. once we started working with, whether we were trying to hang it on the wall or the plywood the quality stood out even more. even after wrestling with it for hours it still looked great and smooth and and spots of smudges from our fingers wiped of easily. they still do! however, we quickly discovered that wallpapering really isn't for everyone. while the idea of having walls covered with some of graham & brown's most gorgeous papers (like this, this, or this) we were just not willing to go the lengths of sanding, mudding, and prepping our textured walls for adhering it directly. 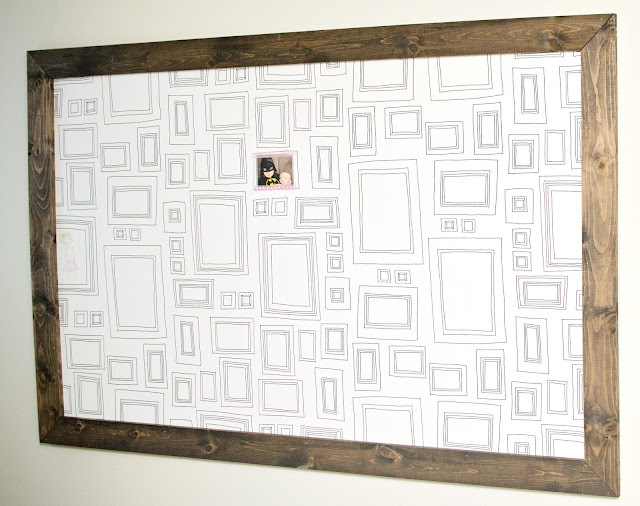 so, after several trips to home depot to try and make it work the old fashioned way, tim came up with the idea to glue it to a piece of smooth board and create a frame around it. i was sold. ok, at first i was totally bummed that my dreams of hallways covered in this dreamy paper had gone out the window, then i started thinking - this is maybe a ten year total house for us and i couldn't even begin to image leaving behind, or worse having to tear down, such wonderful little gifts the kids are surely to leave on this paper. lightbulb! i just had to share with the world this idea we had come up with - readers, have no fear, you can have the wallpapered space of your dreams too! renters, visitors, kids rooms, bathrooms, garages, you name it. to create our frames wallpaper gallery, we used a four by six piece of mdf and one 1 x 12 and one 1 x 8 cut in half then stained to this delicious brown color. before attaching to the wallpapered board, tim angled the ends of the frame pieces so that they would line up and look like a real frame. see, easy peasy! we originally played around with many different ideas on where to hang it, finally settling on the main hallway outside of the kids rooms. a perfect place to spark conversation and grow with the kids and their artist talents. zoe has been plotting for days exactly which animal she will paint on it first. since we chose to use our frames paper this way, limiting the amount of area to decorate, we have made a deal with the kids that they can draw or paint or glitter or whatever once every other month. this way they can thoughtfully be thinking about what they want to create, the space won't fill up so fast, and it will be a keepsake of watching their talent grow and change with them. i would love to see all sorts of medias used like feathers and glitter and photos and scrapbook paper, skies the limit! i still want to add a fun hook on a side piece of the frame and hang a little tin bucket filled with art supplies for passer byers to create if they fill the need. oh, the memories that this gallery will create. what do you think? what would be the first piece you would add to our gallery if you stopped by? the frames wallpaper sells for $32-$45 per roll (20.5" W x 32.8' L) and is available for purchase in the US at graham & brown. graham & brown offers amazing sales monthly, stay in touch by liking their facebook page to hear about all the deals. happy out as long as in day! last saturday i noticed that we hit the "out as long as in" milestone for robin. a silly thing to make note of but i would be lying if i hadn't set a reminder on the calendar just so i could set up a fun comparison photo shoot. i was thirty-eight weeks and four days the night robin came into this world, the longest i had ever been pregnant. born just hours before halloween, our little prince came into this world and today he is just over thirty-nine weeks old. same dress and belt and boots, just changed up a little bit for the warmer summer weather. it makes me giggle a little because this giant boy compares well to that giant belly i was sporting in my last few weeks of pregnancy. just shy of fourteen weeks until he is one, it is unbelievable how fleeting his time as a baby has been, but my baby he'll forever be. happy out as long as in day robin dash! recently i have come to really appreciate the fact that, between our house and a hour down the mountain loop highway is about the most gorgeous nature that washington has to offer. 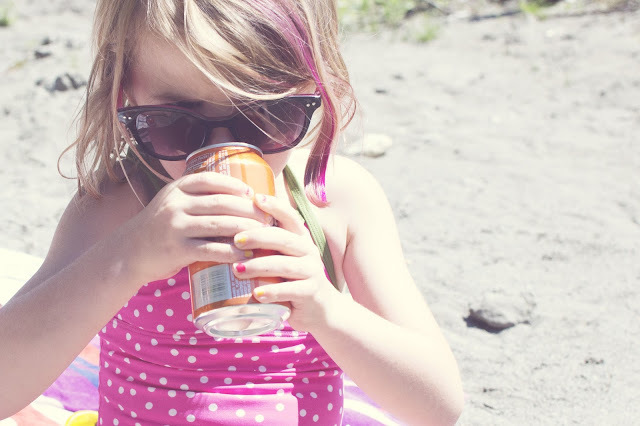 there are a handful of amazing hikes (most easy enough for kids! ), the stillguamish river as it follows you down the highway, and many more gorgeous scenes as your drive. last weekend on a whim we packed the kids and a picnic into the car and set out to find the perfect spot along the river to dip our toes and enjoy the day. after circling back and forth through crowded parking lots and picnic areas, we pulled off on the side of the road and made a little hike down a bank to the most perfect and private spot. 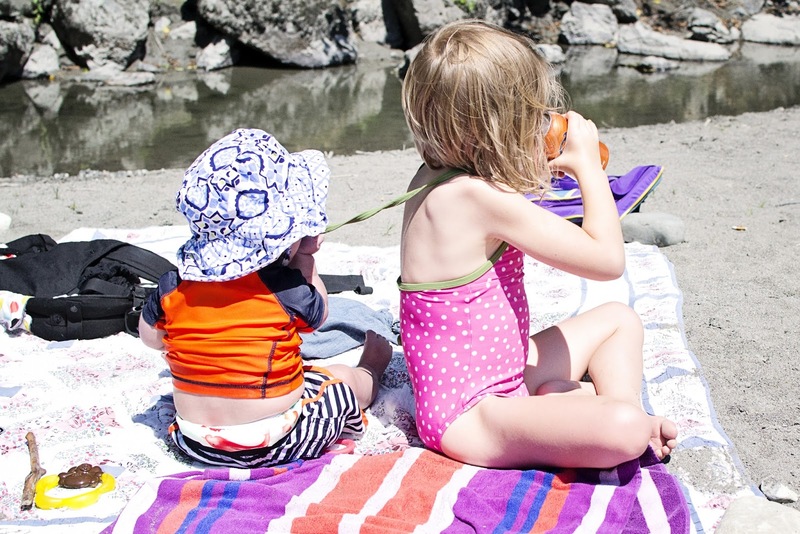 there were a few still and deep spots in the river and everywhere else was shallow enough for the kids to wade and collect perfectly smooth and flat rocks. i took up residence with my chair in the water keeping my core nice and cool in the hot sun and rowan made camp next to the snack bag as usual while robin continuously untied and ate the strings to her suit. this spot had the perfect mound of sand on the shore and a big tree for jumping off of into the deep spots. later the kids even discovered a huge pit of river clay and spent the last hour making sculptures and writng on rocks with their dirty fingers. the water was fridged but we got used to it fast and robin didn't even make a peep when him and tim would venture out and dip in. i wagered with all of the kids that they could have a ice cream cone if they dove in and got all the way wet. it was the perfect day! horseflies aside we had tons of fun and are already plotting a trip up with tubes to float in next time. the best family trips don't have to be about museums or downtown or spending a lot of money. sometimes they are rght in your back yard.